"Had a Dad" Alzheimer's Blog: where do the things we love go after death? where do the things we love go after death? My beloved Pathfinder is going to the junkyard this week. I've had it since Memorial Day weekend of 1994 and driven it a hair under 150,000 miles. (It saddens me to think it will never reach that milestone.) I am sure, in my heart, that we see those we loved again on the other side. Everyone with pets knows about the rainbow bridge (look it up, bring tissues). 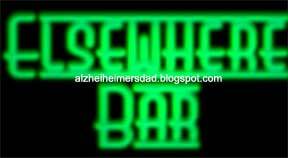 A while back, I talked about the Elsewhere Bar, where those with dementia and Alzheimer's go to find themselves again after death. I'm sure my dad's the greeter, slapping them on the back and helping them find a seat. Outside in the field, of course, are all our pets, and other loved ones wander about doing whatever it is one does in whatever form of heaven one believes in. But where's my car? I love my car almost as much as I love my pets. I can't bear to think that it's being cubed/crushed (after being an organ donor--they're taking everything worth anything off it first) and that's it, just like I can't bear to think that death is just a candle going out and there's nothing on the other side. (Belief in heaven is the only thing stopping me from being an atheist.) So I've added a new territory, of sorts, to my concept of heaven, and now the Elsewhere Bar has a parking lot. My dad's old Corvette can hang out with my Pathfinder, and any other cars that were much beloved when they were on the road. As I kept going in Meriden Hyundai trying out cars and talking to various sales people, it got easier not to see my dad there. Easier to say "I'm Bob's daughter" and realize the person I'm talking to didn't know him. But oftentimes in the process (which still isn't over) I got frustrated. I wanted my father, just so he could EXPLAIN things to me. So I'd know no one was ripping me off. Not that they would, but I am paranoid when I'm spending that much money. One thing about death is the guilt of realizing Dad did a good job of making me independent of him, and that, though I'd love him to still be here to hang out, he equipped me to be without him and that's ok.
Marty, that's really beautiful. Thank you.